Two Sukhoi Su-24 Fencer attack aircraft, belonging to Syria’s 819 Squadron operating out of Tiyas air base, took to the air, making their way towards Cyprus, and RAF Akrotiri. Both were spotted approaching by an E-3D AWACS, and a Type 45 destroyer of the Royal Navy sitting offshore. Both Su-24’s refused to respond to repeated communications attempts, leading to two RAF Typhoons being scrambled to intercept. 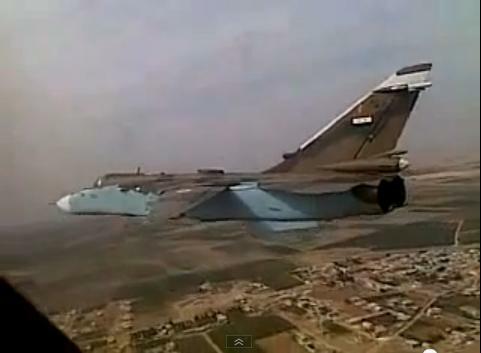 Before an intercept could be made, both Su-24’s altered course, and returned to Tiyas. Turkish F-16’s, operating out of Incirlik Air Force Base were also scrambled, but arrived on scene after both Su-24’s had already departed. Its all fun and games, until aircraft penetrate the exclusion zone. When that happens, all bets are off. ~ by arcturus415 on September 9, 2013. Oh great here we go it looks like someone making little probe tests so see when and how fast they are detected. Its normal, and happens all the time, all over the world. Thats not to say that its a great idea.